July 30th was National Cheesecake Day, but really do you need a reason to celebrate the rich, delicious dessert? Here's a hint, the answer is no! In honor of a yummy day, we're rounding up the best recipes for you to whip up this weekend. Trust us, nothing wins over the crowd more than a homemade cheesecake. 1. We have to start our list with the classic Perfectly Plain Cheesecake recipe from What's Cooking America. It may say 'plain' but this rich, fluffy cake is far from it. 2. If you're wanting something a little more interesting, combine two classic favorites with The Chunky Chef's Brownie Bottom Cheesecake. A surprise delight at the bottom of your pan! 3. Reese's lovers rejoice! This Cheesecake is loaded with peanut butter-y, chocolate-y, sweet yet salty heaven. 4. Have a little one that loves frosted animal crackers? Ok, we won't lie, we are pretty obsessed too! This Frosted Animal Cracker Cheesecake is not only delicious, it's also pink, pretty and perfect for any party! 5. Speaking of classic cookies, check out this Oreo Cheesecake. If you love Oreos, this one has you covered! It's loaded with the crunchy, creamy goodness. 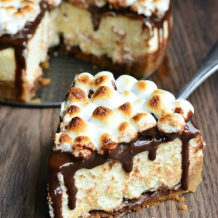 Need more Cheesecake heaven? Check out this post with over 50 recipes!